Let's discuss the two most common types of hip fracture, and the most commonly encountered. While there are many variations, there are essentially two main types that most people suffer from, and that require some kind of medical/surgical intervention. 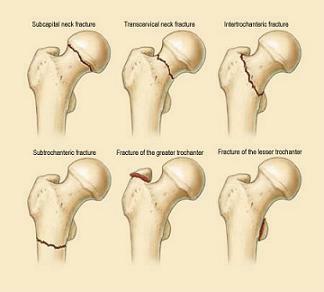 The picture below illustrates the various fracture types, but we’ll limit discussion to the most common ones; the inter-trochanteric and femoral neck fractures, as shown in the top row of the picture. 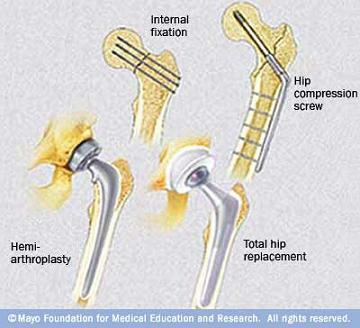 The first type is the inter-trochanteric hip fracture. From a medical terminology perspective, the name of the fracture typically identifies where the fracture occurs and what anatomical parts are involved. Therefore, “inter”-means between and “trochanteric”-refers to the trochanters, or large attachment points for muscles. This type is widely considered to be the “garden variety” of injuries, and commonly seen in the elderly fall category. The inter-trochanteric fracture usually occurs from a fall either directly onto the outside area of the affected hip, or a fall directly onto the buttocks, literally in a “seated” position. It can be essentially non-displaced, meaning not out of position or normal alignment, or it can be displaced at many levels of severity, and require surgical stabilization to promote proper healing and restore the ability to walk. Typical symptoms of hip fractures include, pain, inability to stand and/or walk, and most importantly, shortening and external rotation (rolling outward) of the affected leg, which results from severe muscle spasm from the injury. Surgical procedures typically required to stabilize these injuries range from the hip “pinning” to inter-medullary nail insertion, to partial hip replacement. 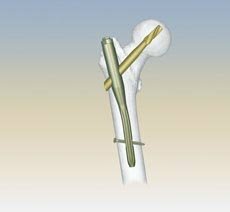 The hip pinning procedure actually doesn’t use “pins”, rather it involves the insertion of a large threaded screw into the femoral head (ball, and is attached to a metallic plate that is applied and screwed to the side of the femur (thigh bone). The two together form a stabilizing framework to prevent fracture motion and to promote healing. 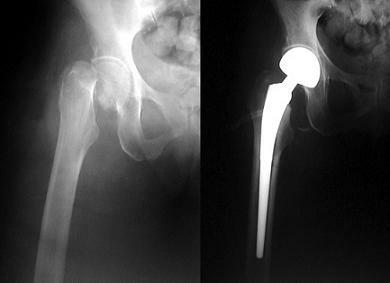 Another, rapidly evolving procedure for inter-trochanteric fractures is the Trochanteric Femoral Nail insertion. This procedure involves the insertion of a screw or blade-like device into the femoral head, together with inserting a short metal “rod” into the upper portion of the femur. The two parts are then “locked” together to form a rigid internal fixation device that limits unwanted fracture motion and promotes healing. The other common hip fracture type is the femoral neck fracture, where the fracture occurs somewhere between the femoral head and the base of the femoral neck at the greater trochanter. What is important here is that the location of this fracture, as well as the amount of “displacement” (loss of normal position and alignment) of the femoral head will directly determine the type of surgery that is required. In looking back at the top row of pictures of hip fractures, you will notice two fracture types, where one fracture line is just under the femoral head, while the other is farther down the femoral neck toward the greater trochanter. The fracture that occurs close to the femoral head is called a “sub capital” fracture; sub=beneath, and capital=femoral head. Important note here too: The closer to the femoral head a fracture occurs, the greater the risk of death to the ball from disrupted blood supply. Also, the greater the degree of “displacement” the greater the risk of bone death as well. The following x-ray illustrates a hip fracture in which it was necessary to perform a partial hip replacement, or "hemi-arthroplasty", because the femoral head was fractured and significantly out of place and the risk of bone death was such that replacement was the needed surgery. In some instances, people with a diagnosed hip arthritis can sustain falls, injuring the affected, arthritic hip. In many of these cases, the decision to proceed wit a full hip replacement is often made due to the severity of the arthritis, thus eliminating the need for another surgical procedure down the road.